On this Motivation Monday, I ask you to forgive this post’s lack of originality as I offer my annual dose of Thanksgiving-infused inspiration. Right up there with the Fourth of July (which takes place in my favorite season), Thanksgiving remains my all-time favorite holiday because it’s a day that makes us stop and give thanks for everything good in our lives. And what better way to take that pause than spending some quality time with family, friends…and plenty of yummy food and drinks? Move it! Don’t skimp on the activity this week. Remember, ten minutes of exercise are always better than zero. The bonus is you’ll have the mental boost knowing you made an effort prior to the Turkey Day feast. On Thursday, even if you’re hosting the holiday fun and can’t leave the house, you can pop in an exercise DVD or bang out a Tabata first thing in the morning. Or sneak out for some fresh air and a brisk power walk or abbreviated run. Your gym is open? Great! Try a morning group exercise class or attack some cardio and core work. A few solid planks can make you feel strong before filling your belly with delicious eats. Eat breakfast! Be sure to eat something sensible on Thanksgiving morning to kick-start your metabolism. If you’re not feasting until late afternoon, make sure to follow breakfast with a small lunch or sensible snack so you don’t go overboard later. Two ideas: non-fat plain Greek yogurt with a serving of almonds mixed in or a piece of toasted Ezekiel bread topped with a sliced hard-boiled egg and salsa. These protein-rich snacks will keep you feeling full longer than a sugar-infused snack. For me, blending a chocolate Isagenix shake for breakfast is always a surefire way to know I started the day off on the right foot – even if it all goes downhill later! Mind Your Portions! Use a salad or other small dish for your meal. Start with salad or veggies and then add the turkey. Use the remaining space for the potatoes, stuffing and other starches. There simply won’t be as much room left as you’d have on a regular dinner plate. Savor the Flavor! Eat slowly! If you do clean your plate, wait 10 minutes before going back for round two. This will help you decide if you’re really hungry. If you aren’t, you’ll feel good knowing you had one helping – before moving on to dessert, of course! Keep Tabs on the Libations! This is the perfect day to follow the every-other-drink-is-alcohol plan. Enjoy a glass of wine, beer or cocktail then have a glass of still or sparking water before moving on to the next cocktail. Make Doggie Bags! Hosting the holiday feast? Don’t be shy about giving some of the uneaten turkey and trimmings to your guests. I wrap things up by offering heartfelt wishes to all my readers for a very Happy Thanksgiving! With each year that passes, I grow even more thankful for so many blessings including my family, my friends, my health and for the support I receive from my “fitfam,” which includes all my loyal readers. 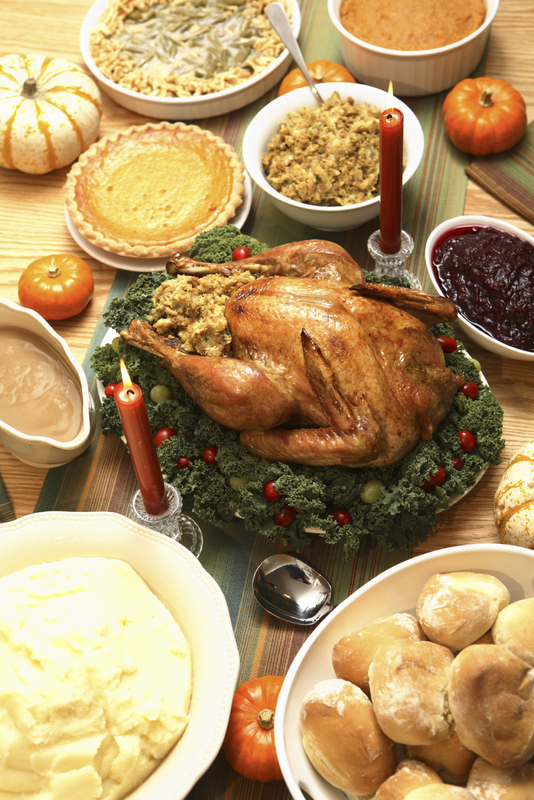 One final note: If you end up breaking the calorie bank this Thanksgiving, don’t sweat it. Laughter, good food and even some good wine can be the perfect ingredients for a happy holiday as we continue our ongoing journey to have fun, be fit and feel fabulous! Posted on November 20, 2017, in Fitness, Health, Nutrition and tagged Calorie Control During the Holidays, Happy Thanksgiving, Holiday Eating Survival Tips, Holiday Eating Tips, Isagenix, Motivation Monday, Personal Fitness. Bookmark the permalink. Leave a comment.